Admittedly this Lenten season has not been one of my best. Actually, in writing that I feel kind of silly because I’m not sure that God is measuring our Lenten experiences on a scale of “Poor, Fair, Good, Better, Best”. Nevertheless, I feel the need to just finish strong and strengthen what remains in these last few days and I’m thankful that during Holy Week there is plenty of opportunity to do so. To that end, I’ve decided that I am going to attend an Easter Vigil service on Holy Saturday. I’ve always wanted to attend an Easter Vigil service, but I’ve always been late finding out about services in my area—when I say late, I find out about it at 7:00 and service is at 7:00. This year, I’m not leaving any stone unturned. I did my research early and now I just have to figure out which one I’m attending—because as you’ll see, there are plenty. I thought I’d share this list so that if anyone is in the New York area, they too can experience the beauty of the Easter Vigil service. If you have any additions to this list, please feel free to add to the comments. Due to construction at GTS, enter the seminary close at 440 W. 21st Street, between Ninth and Tenth Avenues. PS: This is by no means a comprehensive list, you can find more simply by searching “Easter Vigils in New York City” or “Easter Vigils (Fill in the location blank)”. Quick Easter Vigil primer: An Easter Vigil, in some Protestant traditions and the Catholic church, is considered the first official celebration of the Resurrection of Jesus Christ. At the Easter Vigil, a Paschal candle is lit to symbolize the resurrection of Christ and the light of salvation and hope that he brought into the world as a result of His resurrection–and no doubt, His life. Easter Vigil services usually begin after sunset on Holy Saturday but can start before sunrise on Easter Sunday–the sun rise replacing the lighting of the Paschal candle. O Lord, it is true, all that Thou sayest. Thy providence is much better for me than all that I can do or say for myself. Wherefore it may well be said and verified that he stands very uncertainly who sets not all his trust in Thee. Therefore, Lord, while my wits abide steadfast and stable, do with me in all things as it pleaseth Thee, for it may not be but well, all that Thou dost. If Thou wilt that I be in the light, bless Thee; and if Thou wilt that I be in darkness, bless Thee. If Thou wouldst comfort me, bless Thee; and if Thou wilt I live in trouble and without all comfort, bless Thee in equal measure. Lord I will gladly suffer for Thee whatsoever Thou wilt shall fall upon me. With the same thanks will I take of Thy hand good and bad, bitter and sweet, gladness and sorrow; and for all things that shall befall me, heartily will I thank Thee. Keep me from sin, Lord, and I shall dread neither death nor hell. Put not my name out of the book of life, and it shall not grieve me, whatsoever troubles befall me. I wish to be this fully surrendered to His will. Once this beautifully-presented appetizer hit the table, I was filled with such excitement about what I knew would be a magically-delicious moment. The presentation and the sheer bounty of lobster meat overwhelmed me and this was just the appetizer! My friends stared in amazement and one of them said, “That’s that supplement.” To that I proceeded to enjoy every tasty morsel of sweet lobster meat seasoned and cooked to perfection and drenched in a basil and lemon chili sauce. I was so thankful that I took the supplement because it made the entire meal that much better. I talk about this like it just happened, but the reality is, it was two days ago, but that supplement–and I’m not talking about the extra $10–has stayed with me. It made me think about the concept of the “supplement” and how supplements are an important parts of our lives. There are vitamin supplements that we use to help us get some of the nutrients in our bodies that we are otherwise missing. There is the supplementary income via extra jobs some of us have to make ends more than meet. There are supplements that some women use to enhance certain parts of their bodies to make them feel better and attractive to more men. And then there is the most important supplement of them all, the spiritual supplement. The spiritual supplement is vital to our walks as Christians. There is no way we can sustain ourselves on a diet of Sunday sermons and Sunday sermons alone. We must supplement the appetizer we get on Sunday with hearty entrees every day of the week via our personal reflections on the Bible. Supplement that with commentaries, concordances and dictionaries to help us dive deeper into the word. Supplement that by reading theological, historical, and contemporary Christian books to glean more about our great faith and great God. Supplement that with other teachings and other methods of hearing the word of God–always testing the spirits of each person you hear from to ensure that they are from God. There are many supplements that we can use to deepen our relationship with God. These supplements strengthen us and help us move from an embedded theology (the messages we hear in church or that we were raised with that rush to the frontline of our Christian experience) to a deliberative theology (what emerges from the embedded theology and challenges us to grow and ask real questions of the faith)–thank you Rev. Gina Stewart for that knowledge. It’s not just about what we are presented with on a Sunday morning as an option to help us on this walk, but it is what we use to supplement it that will help us move into a deeper, more meaningful relationship with God. That’s that supplement. People talk about being very affectionate whether it be in their romantic relationships, their friendships or with people in general. This affection can be denoted by the gentle touch a woman will assail on a man’s wrist to “check the time”, the way a man caresses the face of a woman he adores, or the wonderful way that someone can, in the words of one of my favorite artists Erykah Badu, “walk up behind me and kiss me on my neck and breathe on my neck”. It’s the way you hold hands with someone you like and even how you hold hands when we are all gathered together in prayer. It’s the hug shared between friends. The holy kiss shared between the saints. The way when you rub someone’s back or just stay very close to them when you sense they are in need of comfort. It’s even in the way you look at a person, your body language toward them. It’s in the things you say and the things you don’t. Affection, between people, is about the use of our bodies and our selves to delicately communicate our like or love for a person, be it platonic or romantic. But between us and God, what does affection look like? Like really? What does it look like when God has won our affection? There is not a time when I listen to this song and I don’t get caught up in thinking about how awesome it is to have and know the God who welcomes my affection. My good, sometimes awkward, always pure affection. I’m not the master of being affectionate with people, and there are many people’s model of affection I’d love to imitate, but I take comfort in knowing that I have countless and everlasting opportunities to perfect being affectionate with a God who will never deem my affection imperfect or awkward because our affection is spirit to spirit affection. Because of this, I am thankful to say, on this day, unashamed, that the God of all creation has won my affection, captured my heart, you have my devotion, and now I am His, completely His, forever. Note: There’s no video accompanying this post. As I was writing this, I wondered if it was getting too long particularly because I knew I still needed to embed the video. I didn’t search for the video until after I finished writing this post and that’s when I found that the version I am looking for, from Champions for Christ, doesn’t exist on YouTube. So, I guess God had His way on this one. You’ve heard the statement before. It comes around during the “Getting to know you, getting to know all about you” period. It’s the statement that you love hearing because when someone asks you that it means they really do want to get to know you. But for the intents and purposes of this post, “Tell me something I don’t know about you”, has nothing to do with our horizontal relationships and everything to do with our vertical relationship. You know, the one with God? I just started reading “The Gift of Being Yourself: The Sacred Call of Self-Discovery” by David Benner. I was initially interested in reading this book because my colleague told me that the book helps you to discover your core sins so that you can handle them and move on with living a blameless life. This sounded pretty awesome to me. Of course I want to know what my core sins are. I was ready to get my enneagram on! But, as I began to delve into the book, the notion of finding out about my core sins took a backseat to finding out whether I really know God as much as I profess to or whether I only know about God. It’s a hard thing to take a look at yourself and figure out if you only know about God or if you know of God. Are you a Pharisee or a disciple? I meditated on that for a while and I continued to read until Benner brought up an “ouch”-worthy point that some of us know God less well than we know our common acquaintances. Benner went on to talk about how relationships develop when people spend time together and how our spending time with God ought to be in the essence of prayer. But he pointed out that we treat prayer like a text message or an e-mail to God. We do a whole lot of talking about what we want and need and rarely much listening. We talk a lot to God but barely allow Him to talk to and with us. When we are having conversations with our friends, we always talk and listen, within the span of the conversation. We don’t just talk for 30 minutes and then walk away from the conversation leaving our friend with no opportunity to talk. (Or maybe we do and this problem extends to other areas of our lives.) But, when I considered it under that lens, that we handle our horizontal relationships better than we handle God, I had to stop and think about how I was going to bring that level of attentiveness and diligence into my relationship with God. After all, He is all I have. If I lose every family member and friend I’ve ever known, I will still have God. If I am trying to move from knowing about him and knowing of him partially, to knowing of him in whole, what can I start doing now to nurture the relationship and open the gates of communication? It didn’t take me too long to figure out what I needed to do. I needed to ask God to tell me something about Himself that I currently don’t know. Something I can’t read in the Bible or hear from a pastor, something deeply personal that only He could tell me as I result of my staying on Him like white on rice. Something He’d tell me because He wants me to know and because He wants to deepen my personal experience with Him. I decided that as part of my daily prayer time with God, I would ask Him, “Tell me something I don’t know about you.” I want to sit and wait for His answer with the same type of anticipation that I would with a potential suitor. If it means that I will wait all day for His answer, then I will wait. I will wait with my ears open. I will actively engage myself in waiting for God to tell me something I don’t know about Him. I will watch for His answer, I will listen for His answer, I will wait for His answer and set my mind on Him because I’m really interested in knowing something new about my God, because I am really interested in knowing God in that intimate way. A way that is personal to me. The reality of the situation is, I AM really interested in God. I love God. I’ve said those three words to Him, over and over and over again. I love thinking about Him. I love thinking about thinking of Him. I love thinking about spending time with Him. I love thinking about His word and His history. But, I desire so much more of Him. I want to and need to desire more of Him because He desires more of me. It’s hard to turn your back on a love that strong. A love that loved you before you were even born. That’s love. A love that loves you regardless of what you do. That’s love. A love that sacrificed himself for you. That’s love. A love that knows everything about you and still desires to sit and talk to you and listen to you talk for hours on end about everything and nothing. That’s love. How could I not want to spend myself growing deeper in love with God knowing all of that and much more? He IS love. And so today, I ask God and challenge you to ask Him, “God, tell me something I don’t know about you.” And watch Him take you into a whole new place of knowing Him, personally. If you’ve read this blog for a good length of time you’ll know that I always have great ideas for recurring sections, but hardly the time to keep them coming. So, as I always do, I introduce to you yet another recurring section that I am hopeful will occur again. “The Moral of the Story” will be a review of recent movie release’s spiritual relevance to the body of believers. Nothing more, nothing less. So, let’s get right into it. 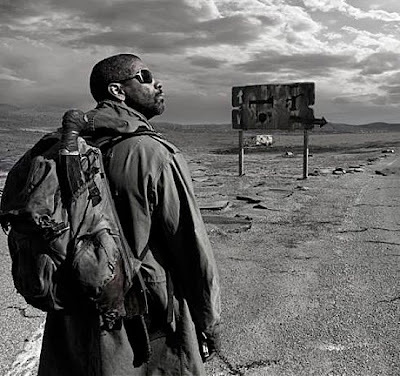 This past holiday weekend I had the opportunity to see “The Book of Eli”, the Hughes brothers post-apocalyptic flick about a man who is carrying the last known Bible and risking his life to protect it. Denzel Washington plays the title character of the film, which comes as no big surprise since he is pretty vocal about his faith in Hollywood. The movie follows Eli’s journey as he navigates the grayish lands of the post-apocalyptic world in search of cat meat, nice boots and clean water. In between all of this he carries with him the precious treasure/weapon of the last King James Bible known to man. He guards it with his life, participates in a little bit of Christian fundamentalist violence to protect it and does all of this while remaining just as cool as he was in “Mississippi Masala” with the gangster edge he had in “Training Day”. He is a man’s man endeavoring to be God’s man. When I first considered writing this review, I was going to talk about all the awesome messages about faith that are packed in the nearly 2 hour film. But then, in a conversation with a friend, I realized that not only is about a faith, but faith from a perspective that men can actually grasp, comprehend, and be changed by. Far too often, particularly in Christianity, men are turned away because they feel like the church caters to the emotional whims of women. The Christian church is filled with more women than men, so men can hardly find a connection there except through the pastor, and even then, he is too distant. But “The Book of Eli” does well to deliver a message that men can find themselves in because it embraces the masculinity of the faith. It draws attention to the one area I believe most men have a problem with when they are navigating the faith, walking by faith and not by sight. It hearkens back to the notion that men are logical creatures while women are emotional ones and thus it is simple for us to get wrapped up in a relationship with an unseen God because our hearts are moved by all that we read about Him. Most women don’t need much proof to be swayed to worship the only wise God. I mean, think about it, we are the ones that go in droves to see romantic comedies and buy Harlequin books because we are wired to desire love. This is not to say that men aren’t looking for love, but they have to go through a process before they even begin to be ready for love on the level that I feel we were born with. Nevertheless, back to the point at hand because I am no expert on the matter. In my conversation with my friend she mentioned that a guy friend of hers said that the movie changed his life because of the concept of walking by faith and not by sight. This is all Eli did throughout the movie. He possessed the great faith to walk around with a book that others wanted to possess for evil and were willing to kill him for and didn’t bat an eyelash. He was tough, but still weak enough to realize that He could do nothing without God. He knew how to be chivalrous and cavalier in the midst of a bunch of brutes. He could wield a bow & arrow, a machete or a gun, but he knew his way around the Good Book with ease and cunning. He was just an awesome example of masculine faith in a marketplace sometimes too dominated by women of faith. He was Denzel Washington for God’s sake, toting around a Bible, reading a Bible and reciting the 23rd Psalm and there was nothing femme about it. I don’t really want to belabor this review any longer suffice to say that if you have a man in your life that is teetering on the edge of his faith, this is the movie for him to see. I’m not going to guarantee you that he will walk out of the theatre a changed man, but what I can say is that any man with an iota of a heart for God will be moved by this movie’s message, walk by faith and not by sight. Quote of the Day: Dr.Martin Luther King, Jr.
On this day, many of us are off from work because of a man who made it his life’s work to fight for our rights and equality as a people. Sometimes I feel so far removed from his legacy because of the things that I see in the world around me today. But then I look back at his body of work and the passion that drove him to continually fight for our freedom. In thinking about that it leads me to one of his great speeches, which, comprehensively was amazing, but there is one portion that was so telling and such the summary of why God put him on this earth. On this day, if you do nothing else to acknowledge the life and work of the Rev. Dr. Martin Luther King, take the time to consider his words and his faith to do God’s will against all odds. Like the great men and women of faith in the Bible, he passed being commended for his faith, but not receiving what was promised, but God provided something better for us in that Dr. King became a modern day example of faith. On this day we celebrate your great faith Dr. King. Happy MLK day to all! Last night I took a spinning class for the first time. If you are unfamiliar with spinning the quick description is that it is a low-impact cardio class that takes place on a stationary bike where you do intervals between the easy, moderate and hard tensions on the bike in either the sitting or standing position. I don’t know why I was so determined to go last night, particularly after hearing from a few people that the spinning is way intense and I would be drowning in a pool of my own sweat, but I didn’t care, I was up for the challenge. After all, I can do all things through Christ who strengthens me, right? Right. I entered the class early and searched for a bike that was hidden so that my novice status wouldn’t be given away immediately. I found a bike in the corner and started to make the necessary adjustments when I realized I wasn’t sure what to adjust and why. Luckily the instructor caught wind of my status and she quickly came over and explained how I should adjust the seat to my hip bone, the handle bars so that I’m not too stretched out–for a beginner, strapped me into the pedals on the bike and told me about how the class would go. She told me that since it was my first time I should just take this class and the next three just to get comfortable. She then left me to my own devices and pumped up the volume so that class could begin. Class started with only five people, so I had no time to get intimidated by a bunch of “go hard or go home” freaks. We started off easy enough as she let us pedal at a normal speed with the tension on the bike nearly non-existent. But soon she asked us to turn the tension up to moderate to do our first stand-up ride for 30 seconds. “This should be ok,” I thought to myself. WRONG! Actually I made it for 20 seconds before my legs started burning and I relented under the pain and sat down. Class went on like this for 45 minutes. Stand up 30 seconds, sit down for 3 minutes, stand up for 3 minutes, sit down for 30 seconds, adjust the tension to moderate, ease the tension, climb uphill, feel the beat, sprint, pump it, feel your heart beat outside of your chest, let the sweat drown you…The whole time, I thought I would die. Ok, that’s an exaggeration, I never thought I was going to die, but if you saw the look on my face, you would have thought I thought I was going to die. But I did realize the thing about spinning is it is not so much a test of your physical strength as it is a test of your endurance. The whole time I kept thinking, “Don’t give up. You can make it. Just hold on.” Most of the class I was saying these things under my breath and even thinking about the scriptural conglomeration between Ecclesiastes 9:11 and Matthew 24:13, “The race is not given to the swift, nor to to the strong, but to the one who endures to the end.” Our walk with Christ is not so different from a spinning class. We exist between two tensions, the tension of the world and that of being with God. The tension of the world would represent the easy tension on the bike. In the world we are pedaling fast but not actually going anywhere. But the tension of being with God is the moderate tension where our feet grip the pedals and we have to climb uphill to reach for the mark of the higher calling. And that climb strengthens us. Walking with Christ is not supposed to be easy and there will be alot of opposition, but you have to push through all of that to walk in the light. When we decided that we’d rather walk with Christ than be of the world, we decide to take a walk that will not always be a cake one. In the moderate tension pedal uphill, we must encourage ourselves. I was on that bike telling myself I could do it, even if it meant I couldn’t always stand when everyone was standing. But it was my ability to speak positive words to myself that I stayed strapped in and on the bike. Truthfully it hurt being strapped into that bike. My feet were bound by these straps that made sure that when I stood up or when I pedaled fast, I’d never fall off, but isn’t God like that? He is the strap that ensures that no matter how fast we go or what position we take (for Him), we never fall. Finally there were moments when I was pedaling so fast that I felt out of control, but my saving grace was this emergency stop button the instructor told me about. She said that if ever I need to stop or slow down, all I needed to do was push the button and it would stop the wheel from turning and thus my legs from pedaling. Throughout the 45 minutes of the class I was so thankful for the big red button. Each time I felt out of control, there it was for me to use. And God is there for us everytime we feel like our lives are out of control. He is the big red button we can push to stop spinning and start sitting with Him in peace. For Him, all He wants to know is that we trust Him enough to seek Him in our times of need (and outsides of our times of need.) For Him, He wants us to hide His word in our hearts and use that as fuel to keep going. For Him, all He wants to know is that we desire to endure to the end. My goal in last night’s spin class was to simply endure through the class and that I did. My goal in my life with God is to simply endure to the end, and that I will do. This morning, as I entered the elevator on my way up to my office, a casual friend of mine asked without hesitation, “So, what are you going to be for Halloween?” I laughed and replied, “You presume that I celebrate Halloween.” To which he looked at me quizzically and said, “You don’t, why not?” And there in the elevator in front of him and two other riders I told him in short order that I don’t celebrate it for spiritual and personal reasons. The quizzical look didn’t leave his face. You would have sworn I just told a child that Santa didn’t exist. I was saved by the bell and released from this awkward situation when the elevator reached my floor. But as I walked up the stairs to my desk I thought to myself, “Has Halloween become so commonplace that everyone is expected to acknowledge it and celebrate it?” Well, apparently so. I listened to a colleague of mine conducting business with a writer and at the end of her phone call she wished her writer a happy Halloween. A member of upper-level management left for the day and wished me and another colleague a “Happy Halloween”. The people on The View dressed up for Halloween. Even Bill O’Reilly, a guest on The View, dressed up in a very apropos vampire costume for Halloween. Yes, this is the world we live in, where people are okay with celebrating darkness if for only one day–actually make it two–but when it comes to celebrating light and it’s likeness we have to mince our words and/or completely change them. “Happy Holidays”, we say because “Merry Christmas” is imposing a specific set of beliefs on people, but saying “Happy Halloween” is not imposing a set of beliefs and traditions on people? This is the world we live in. I am not going to knock Halloween. I think I’ve done it in years past and personally I am tired of beating a dead horse. I’d rather talk about the living word and the man who is alive. I don’t really have a particular resolution to this dilemma of a world insistent on being comfortable with a holiday that celebrates darkness, fear, and evil for fun’s sake. So suffice to say I will tell all who are satisfied with what will take place tonight and tomorrow not to get too comfortable in the darkness because all that is done in the darkness shall come to the light. What happens on Hallow’s Eve and on Halloween will not stay in Hallow’s Eve and Halloween–that should be scarier than the number of ghouls, goblins and other sordid creatures that will come alive. You want scary, read the book of Revelation, now that is scary as hell. So govern yourselves according. I can’t tell you to have a Happy Halloween, nor can I condone it’s celebration, but if you insist, be safe and don’t do anything I wouldn’t do. See you in the light.